The last of my daughters moved out and it was time for me to do something fun and just for me. 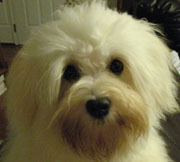 I began researching dogs and decided that I’d look at the Coton De Tuleurs. When I finally got my hands on one I knew that the cottony texture of the coat was more than I wanted to deal with. 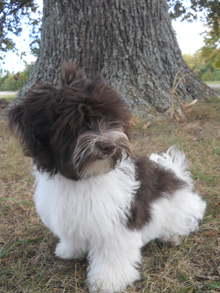 The breeder I spoke to and visited with was wonderful and sent me in the direction of the Havanese. I found a breeder nearby and went to visit her and her dogs. I was in LOVE!! The soft flowing hair and spunky, playful demeanor of the breed had me sold. I wasn’t raised in the world of pure bred dogs and dog shows. However, I have always had a dog, some were pure bred and others were not. My first dog was “Dutchess” a Dachshund and I had her for about 11 years. She was wonderful! Then came a slew of other dogs including a number of Hienz 57’s, Rhodesian Ridgebacks, Yorshire Terriers and then Jessie – an American Staffordshire/ Lab mix. Jessie has been stolen by my mom and is very happy living with her. I found Maggie and recruited a friend to go with me on a 16 hour (round trip) adventure to look at her and bring her home. I began showing her the following November. I now have a wonderful group of friends and mentors in the Southern Magnolia Havanese Club and have met some truly nice and helpful individuals involved in one way or another in the dog show world. My Havanese family has grown now and includes Maggie May, Simon, Sugar Bear, Gracie Lou, Dino, Willi and Tater. Dino WIlli and Tater are Maggie puppies Thanks so much to the breeders and friends that have helped us grow. Your friendship is very important to us. On April 29, 2009, HINZ-N-CO HAVANESE welcomed its first litter of puppies. Seven beautiful puppies who were dubbed the “Flintstone Gang”. This is how HINZ-N-CO HAVANESE began! We are enjoying the ride and welcome you to join in the fun.